Greensboro starter Alexis Santaella pitched into the ninth inning in this May 1994 game and earned praise from his manager Trey Hillman, according to The Greensboro News & Record. But the start went for naught as Greensboro lost the game, The News & Record wrote. "I was real impressed with the job Santaella did," Hillman told The News & Record afterward. "It's just a shame we picked a night when we had a lapse offensively." Santaella earned that praise in his fourth season as a pro. That season also proved his last. He never made AA. Santaella's career began in 1990, signed by the Yankees out of his native Venezuela. 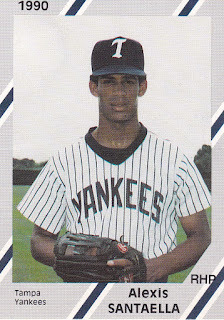 Santaella started with the Yankees in the rookie Gulf Coast League. He got into 14 games, started five. He went 3-2, with a 3.35 ERA. He returned to the GCL for 1991. He got into another 14 game there and ended with a 5.35 ERA. Santaella isn't credited as playing in 1992, but he returned to the GCL in 1993. Another 17 outings there got him a 3.24 ERA. He played his final season at Greensboro. In 24 outings, 15 starts, he went 7-7, with a 4.19 ERA to end his career.